The past 10 years have been quite an amazing ride. In December 1996, while a university freshman, I sold the first three copies of HelpScribble 1.0. I never graduated, but what started as a hobby has grown into a thriving business, my full-time occupation since January 2000. It’s been more successful that I had dared to dream 10 years ago. As we swap the 2006 calendar for 2007 (or 2550 here in Thailand), I’d like to thank everybody who has been a part of our success by purchasing one or more of our products. I spent quite some time going through the outstanding feature requests for all our products, giving me plenty of plans for 2007. Right now my focus is on Windows Vista. The latest versions of all our products should be fully compatible with Vista before its public release on Jan 30. I hope that 2006 has been a good year for you as well, and that 2007 may be even better. I’ll try to do my part with new and improved “Just Great Software”. Until next year! Windows Vista includes quite a number of new fonts. The Segoe UI font has received a lot of press, as that’s the new default font for dialog boxes, etc. But the Consolas font is the one that’s captured my geeky heart. It’s without a doubt the best TrueType font for programming I’ve ever come across. Courier New and Consolas are the only two TrueType fonts that have a property that’s vital for programming in a modern syntax-highlighting text editor: they’re not just monospaced, but their bold and plain variants have the same width. This means that columns will always align perfectly when highlighting keywords etc. in bold, without the editor having to squeeze the bold characters or having to stretch the plain characters. Other popular monospaced fonts like Lucida Console and Andale Mono use wider characters for their bold variants. This means they’re only monospaced if you don’t mix the bold and plain variants. Consolas is a sans serif font, just like Lucida Console, Andale Mono, or Arial for that matter. Most people find sans serif fonts easier to read on the screen. Serif fonts like Courier New or Times New Roman are better suited for print. 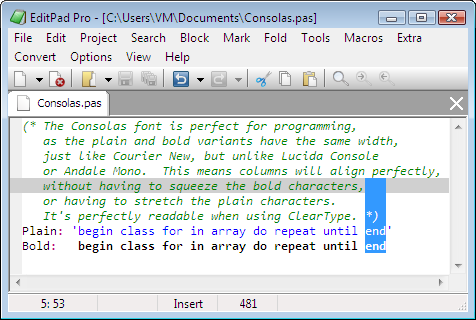 But the key benefit of Consolas is that it’s designed for ClearType. ClearType smoothes fonts by anti-aliasing them using pixels of various colors, taking advantage of the physical characteristics of LCD screens. (ClearType looks bad on CRT screens.) I never cared much for ClearType, because many fonts, including Courier New, actually become harder to read when they’re smoothed this way. Consolas, however, looks perfect when rendered with ClearType. If you’re not using ClearType, then Consolas doesn’t look nearly as good as Courier New. It has too many black pixels that seem out of place. Consolas is clearly designed to be smoothed. To top things off: the character for the digit zero has a slash going through it! Consolas ships with all versions of Vista, including Home Basic. The screen shot below shows EditPad Pro running on Vista Home Basic. If you’re using Visual Studio 2005, you can download Consolas from Microsoft. If not, you still may be able to use the font, though your mileage may vary. I was able to install it on a Windows XP SP1 machine that doesn’t have any version of Visual Studio. This PC does have the Microsoft .NET Framework SDK which creates various “Microsoft Visual Studio” folders under “Program Files”. These may cause the Consolas installer to think I do have VS 2005. I got no error messages, and the font was instantly available in all applications. If your PC has an LCD screen (or two), I recommend you turn on ClearType (Control Panel, Display applet, Appearance tab, Effects button, Smooth edges checkbox) and give Consolas a try. The next free minor update of EditPad Pro will use Consolas by default on Windows Vista. Two weeks ago I set up an account with Microsoft adCenter, and set up my most successful campaign just like I have it on Google Adwords. This couldn’t have been any easier due to the fact that Microsoft’s system is very similar too Google’s, down to the number of characters you can use for your ad title and text. With one improvement though: Microsoft allows 1*70 characters for the ad text, while Google insists on breaking it into 2*35. This may seem like a small difference, but 1*70 is way more flexible than 2*35 when you’re using words with more than one syllable. I only set up one campaign because I wanted to gauge the kind of traffic I’d get before spending time to set up all the campaigns like I have them on Google. Microsoft has step by step instructions for importing campaings from Google, but I gave up on those when they tried to explain me how to edit the .csv exported from Google in Excel. Copy and paste between two browser windows (on two monitors, of course) turned out to be much easier. Two weeks later, the first impressions are in. All 1,798 of them. Ouch! In the same two weeks, my Adwords campaign got more than an order of magnitude more impressions, with a similar click-through rate. And that’s counting the Google search results only. Content targeting gets way more impressions, though also a much lower click-through rate. Since there’s no minimum spend on Microsoft adCenter, beyond a $5 or â‚¬5 sign-up fee, I’ll just keep the campaign running as it is. But I’m not going to spend any more time on it until Microsoft starts generating some traffic. Even Yahoo! Search Marketing does better.